The Docks of New York got me thinking about smoke and fog, and what they represent. The movie’s filled with these things. 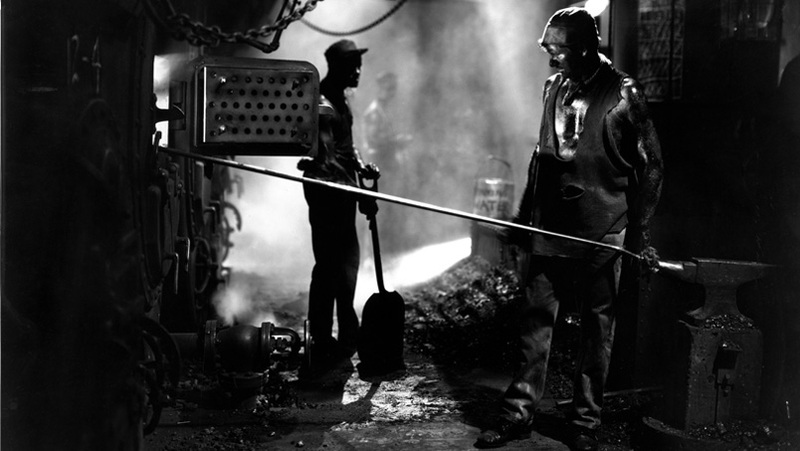 Its protagonist, Bill Roberts (George Bancroft) makes his living shoveling coal into a ship’s boiler, causing stacks above him to belch smoke while he and his grimy mates puff away on cigarettes below. When he and his pal Steve (Clyde Cook) are given one night’s shore-leave, they exit the ship to a dock, shrouded in mist. Bill doesn’t approach this foggy environment with any hesitation. For him, it’s ethereal and temporary. His real world, rendered wonderfully by director Josef Von Sternberg, is the bowels of the ship: all iron and grease, fire and shadow. He’s at ease in this place. 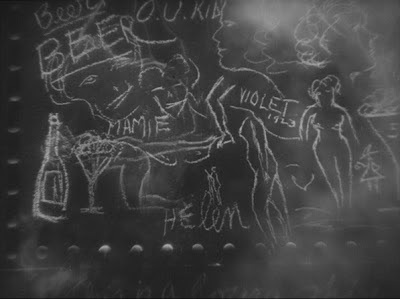 We see Bill grin when he looks at one wall, covered with lewd chalk drawings of women. When he pulls the flame of a hanging gas lamp level with his unlit cigarette, he displays the same nonchalance you would while grabbing your car keys on your way out the door. When Bill dips a dirty ladle in a bucket of water, gargles, and spits on the floor of the boiler room, we know he’s doing it because he’s thirsty, but also because he doesn’t give a damn. Bill exits the ship, looking clean. Strolling along the dock on his way to the nearest bar, where he intends to get plastered, he discovers a pretty blonde floundering in the water. He calmly removes his coat, slips into the water, and pulls her out. The blonde, named Mae, jumped in. We never learn what motivated her to do that—all we have to go on is her weariness and cynicism once she comes around. For Mae (Betty Compson), there appears to be nothing left; and so, little point in worrying about what is to come, even if it might kill her. Bill, whose trips ashore are brief, and geographically diverse, likewise lives in the moment. Later, when he gazes at her water-slicked legs on the bed, we know what he hopes to gain from saving her life. But he chose to save her before he’d had such a good look. That was impulse. The bulk of The Docks of New York takes place over a single night. Mae, strengthening by the hour, takes Bill up on his offer of a night on the town. “I’ve had too many good times,” she says, smoking constantly. “You’ve never been out with Bill Roberts!” he replies. And they do have fun. They even find a pastor (Gustav von Seyffertitz) who reluctantly marries them at the bar. Now Mae’s murk of indifference begins to clear. Her smile loses its ruefulness. She knows Bill’s supposed to be back on that ship tomorrow, off to some faraway land. And she knows she’s not the first girl to wonder if she can keep him ashore—the names of those who failed are tattooed on his arms. But, she’s beginning to have hope. Suicide, loneliness, fidelity—these are the things this film is about, but they don’t define its tone or feel. The Docks of New York is a romance, in one sense; the story of the coming-together of two kindreds, whose opportunity for bliss depends on luck and their ability to overcome their fears. Bill, the hero of the story, seems more than a man—shouldering and pie-facing his way through crowds and swimming from ship to shore without effort. He goes where and when he pleases, causing what ruckus he wishes to; like some lumbering demigod, belched up from the grimy depths, unused and indifferent to the civilized world. And tomorrow, at the crack of dawn, it’ll all end. The spell breaks. Real life begins again for everyone. 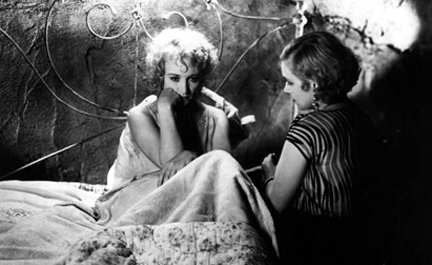 Plot-wise, The Docks of New York is simplistic, both by Von Sternberg’s standards and the standards of late-era silent film. Scenes are heavy with Jazz Age dialogue—which entertains, but also causes a glut of intertitles the film doesn’t always need. The visuals are gorgeous, but Von Sternberg’s always are. These things are not what make The Docks special. What makes it special is the same thing that makes myths and fairy tales special, when we hear or read them as adults: the buried meanings. Bill just shoves the world aside, doesn’t he? But can he do that because he’s something more than a man, or precisely because he is a man? Is his supreme confidence rooted in the fact that he has no fear of hurting people or damaging property in places he expects to leave—maybe for good—in a day’s time? Is it all about commitment? Marriage, presented in many old stories as a bond so unbreakable that it often concludes them, is here made into something more sordid, or at least, ambiguous. Bill and Mae get married for the worst reasons, in the sorriest of environments. Yet Bill’s example seems more pure than that of his shipmate and boss, Andy (Mitchell Lewis), whose own shore-leave results in an accidental meeting with his own wife, Lou (Baclanova), whom he hasn’t seen, or tried to contact, in three years. “Until I got married, I was decent,” Lou cracks to Mae. Andy and Lou’s marriage is real on paper, but dead in practice; Bill and Mae’s may be the reverse. The ending may be a happy one, or maybe not. If Bill, a man of impulse, tends to impulsively do the right thing, will that be good enough for Mae? It seems to be, for now. But now is just where this story ends. Mae’s life will keep going. And in those inevitable, awkward moments of truth to come, she and Bill will likely look at one another, then look away, then light more cigarettes. Smoke, mist—they catch the light beautifully as they billow and twist. But they obscure things, too. They create walls between things—though they have no more strength or solidity than we allow them. Walk through a cloud and you will not be impeded. But you might not know where you’ll end up. 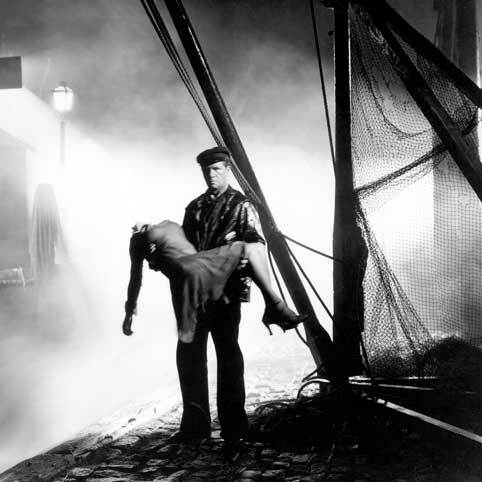 Where to find The Docks of New York:Criterion offers a gorgeous print of The Docks of New York, along with Underworld (1927) and The Last Command (1928), in a three-disc set, 3 Silent Classics by Josef von Sternberg. I just saw this film, wanting to see the star of The White Shadow in preparation for the blogathon. That I never got around to writing a review is just as well, because you have done one that I can only sit back and admire. The idea of this as a fairytale never occurred to me, but I found myself utterly drawn into it - and that tells me you were right because my attraction was the same as it is to more obvious lore on film. Bill does seem more than a man, like Hercules in fact, half and half. Or perhaps more like Vulcan who wins the lovely Venus. Bravo, Chris! Thanks so much, Marilyn. And thanks to you, Farran and Rod for all your hard work on the Blogathon. I loved being part of it, and I can't wait to see THE WHITE SHADOW.